Speed 15 ft., fly 40 ft. Compound Eyes and Keen Sense of Smell. The stingwing has advantage on Wisdom (Perception) checks to notice movement, or that rely on smell. Erratic Flight. 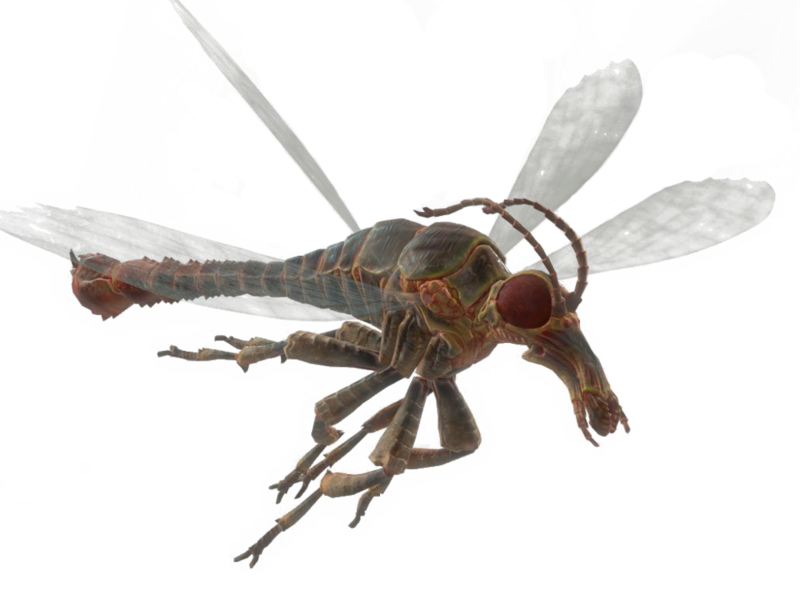 The stingwing flies wildly, and is difficult to hit. The stingwing reduces the damage of any attack against it by 3 (but not damage from an area effect such as a weapon’s burst fire). Flyby. The stingwing doesn’t provoke opportunity attacks when it flies out of an enemy’s reach. Sting. Melee weapon attack: +5 to hit, reach 5 ft., one target. Hit: 5 (1d4+3) piercing damage and 3 (1d6) poison damage. The target must make a DC 10 Constitution saving throw or be poisoned. The target may repeat its saving throw at the end of each of its turns, ending the poisoned condition on a success. Multiattack. The stingwing makes two attacks with its sting. Multiattack. The stingwing makes three attacks with its sting. Sting. Melee weapon attack: +8 to hit, reach 5 ft., one target. Hit: 7 (1d6+4) piercing damage and 4 (1d8) poison damage. The target must make a DC 12 Constitution saving throw or be poisoned. The target may repeat its saving throw at the end of each of its turns, ending the poisoned condition on a success. Radioactive Aura. A creature that begins its turn within 10 feet of the glowing stingwing takes 6 (1d12) radiation damage. Radioactive Glow. The glowing stingwing sheds bright light in a 10-foot radius and dim light for an additional 10 feet. Sting. Melee weapon attack: +8 to hit, reach 5 ft., one target. Hit: 7 (1d6+4) piercing damage, 4 (1d8) radiation damage, and 4 (1d8) poison damage. The target must make a DC 12 Constitution saving throw or be poisoned. The target may repeat its saving throw at the end of each of its turns, ending the poisoned condition on a success. Multiattack. The stingwing makes four attacks with its sting. Sting. Melee weapon attack: +9 to hit, reach 5 ft., one target. Hit: 7 (1d6+4) piercing damage and 4 (1d8) poison damage. The target must make a DC 13 Constitution saving throw or be poisoned. The target may repeat its saving throw at the end of each of its turns, ending the poisoned condition on a success.